We are celebrating JUICE MAGAZINE’s 25th anniversary and want to thank you for your support over the last two and a half decades! This magazine has been a community effort since day one and we love our surf skate punk rock family. Thanks for all the good times and great memories! 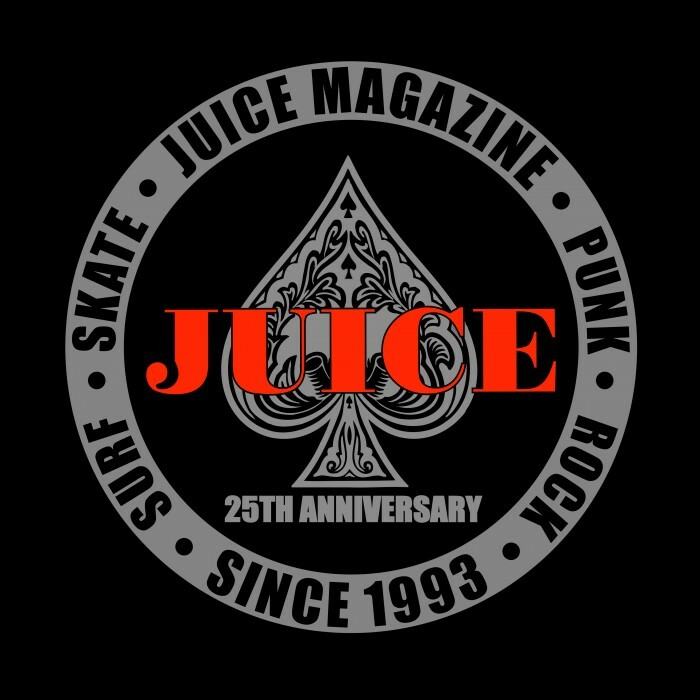 The Juice Magazine’s 25 Year Anniversary Limited Edition Collection is now available featuring t-shirts, long sleeves, hoodies and zip ups, plus every order comes with a new 5 pack of Juice stickers. Check out the collection at http://juicemagazine.com/home/juice-25-year-anniversary-specials/ or you can place your order here. Thank you! Please call 310-399-5336 if you’d like to use your credit card by phone or you may send a check or money order to JUICE MAGAZINE with your name, address and your order to JUICE MAGAZINE – 319 OCEAN FRONT WALK #1, VENICE, CA, 90291. If you don’t see the items you’re looking for, email your order to JUICEMAGAZINE@GMAIL.COM. Please include t-shirt style, color and size when ordering. Allow 1-8 weeks for delivery. FOR INTERNATIONAL ORDERS – Please e-mail JUICEMAGAZINE@GMAIL.COM for estimated shipping fees.